The Health and Safety Executive has been hobbled by an unprecedented and savage funding cut. Safety rules are being relaxed. And the government says it’s all happening in the name of common sense. Don’t you believe it, says Hazards editor Rory O’Neill – it’s a political project driven by the business lobby and built around dangerous lies. Some do, but enough don’t – enough to damage the health of millions of UK workers every year.Tens of thousands die each year of work-related cancers (Hazards 111). Same again for work-related heart, lung and neurological diseases caused by work. Around 1,000 die each in work-related road transport accidents. But scarcely any of these deaths are highlighted in official statistics – the majority aren’t even included (Hazards 92). The most commonly quoted figure you’ll see puts the body count at a couple of hundred work-related fatalities a year. If they don’t count the bodies, the bodies don’t count. Oh yes there is. More people are harmed by work today than at any time in history. We’ve got all the old problems topped off with an epidemic of work-related strain injuries and mental health problems. Even the government’s official estimates acknowledge over 2 million people in the UK are suffering health problems caused by their work, and hundreds of thousands of workers develop a work-related condition each year [See: Workplace harm up, prosecutions down]. New problems are emerging all the time. It’s becoming apparent the microelectronics industry is presenting a serious risk of cancer and other problems (Hazards 112). Nanomaterials could be the next asbestos, but you’d not know it from the rush to manufacture them with precious little regard for the long-term health risks. Several new occupational diseases have surfaced recently, including Ardystil syndrome, reactive dye asthma and flock workers’ lung in the garment sector and popcorn workers’ lung in food manufacture (Hazards 101). And old diseases are affecting new groups of workers – like silicosis in the workers giving your jeans that fashionable worn look [See: Deadly jeans fade out of fashion]. That’s crazy. The number of health and safety regulations has almost halved since 1974. Over the last four years the number of forms used by the Health and Safety Executive (HSE) to collect information from business has dropped from 127 to 54. And firms are hardly being harangued by meddling inspectors. A decade ago, HSE could be expected to turn up at the average workplace once every few years. Now workplaces are lucky to see an inspector once in a working lifetime (Hazards 110). Fewer than 1 in 15 major injuries now results in even an appearance from HSE (Hazards 108). HSE prosecutions and convictions have halved since 2001. 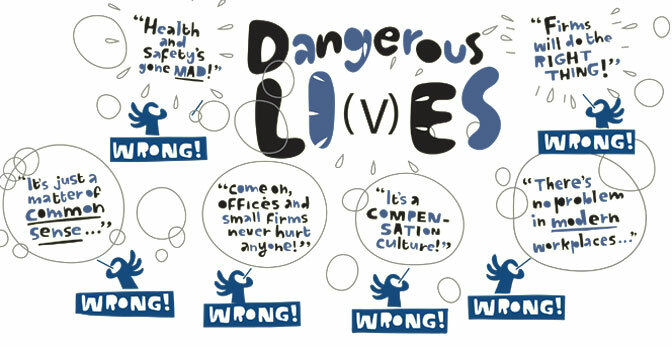 Tens of thousands die each year because of a criminal disregard for health and safety at work. Just a few hundred end up in court, with prosecutions and convictions now at an all-time low [See: Workplace harm up, prosecutions down]. And brutal cuts to HSE’s budget and a new hands-off government policy is going to dramatically reduce official oversight of dangerous employers (Hazards 112). That’s mad. Business says we need a can-do, not a can-sue culture. It’s got it. Fewer than one in 10 victims of work-related injuries or ill-health get any sort of compensation. Government figures show there are now about a third the number of claims for work-related injuries and diseases as there were a decade ago. Only a tiny proportion of those entitled to compensation actually submit a claim [See: Compensation claims have fallen dramatically]. And it is not as though they just give compensation away. Claimants have to demonstrate they are suffering and their problems are the result of their employer’s negligence. If businesses want to avoid compensation claims, all they have to do is avoid hurting their staff. Studies in the UK have established two methods are far-and-away the most effective at delivering safer, healthier workplaces – a credible inspection and enforcement regime (Hazards 111) and worker participation with active trade union involvement (Hazards 110). Voluntary schemes have been tried and have failed spectacularly. In 2010 alone, the Institute of Directors/Health and Safety Executive (HSE) directors’ leadership guidance, HSE’s Corporate Health and Safety Performance Index (CHaSPI) and the HSE-backed Asbestos Building Inspectors Certification Scheme were all exposed as an expensive waste of time [See: Voluntary safety schemes fail, again and again]. The model comes from the US, where an investigation is underway into abuses of their ineffective Voluntary Protection Programme (VPP) and inflated claims of its usefulness. The official focus is instead shifting to inspection and enforcement. In Ireland, the introduction of a copycat VPP scheme was followed by a dramatic increase in workplace deaths. After it switched back to a system based on inspections, workplace deaths fell to a record low. In between disasters, governments love business-friendly talk of health and safety deregulation. Only when faced with a Deepwater Horizon blast or a Stockline explosion, when the deaths come in a rush and occupational health and safety is in the media glare, is common sense briefly restored and talk of responsible inspection and enforcement regimes preferred to blind trust. It amounts to criminal irresponsibility, because the evidence shows that responsible enforcement trumps blind trust all the time, not just when the media is showing an interest [See: Don’t base policy on deadly lies]. Boardrooms don’t care about demonstrating health and safety common sense, they care about demonstrating their profitability (Hazards 110). They have an absolute legal duty to defend the interests of shareholders, but only a heavily qualified “reasonably practicable” legal duty to protect the health and safety of the people they employ. In this dangerously topsy-turvy system, it’s no wonder safety takes a backseat. There are other problems of trusting safety to the common sense of business, rather than the outside scrutiny of an official, properly resourced and empowered enforcement agency. Without preventive inspections, HSE will be unable to uncover those rogue employers who care little for common sense or common decency, particularly those exposing their workers to slow-burn health risks like occupational cancers (Hazards 111). HSE’s own analysis suggests negligent employers causing often fatal long-term occupational diseases are at least 35 times less likely to end up in dock as those injuring workers [See: Bad on safety, terrible on health]. And if HSE isn’t policing the rogues, the prospect of justice after their criminal breaches of health and safety law disappears entirely. Small firms are over-represented in the most hazardous sectors – construction, agriculture and transport. They are often the ones that benefit most from the support of a properly resourced health and safety enforcement agency. One of the sectors with the highest rates of reportable injuries is ‘public administration’ – that’s office work. And violence is a major problem in frontline service industry jobs – including health and social services and retail. Business doesn’t pick up the tab for the injuries and diseases caused by work. An HSE report concluded less than a quarter of the cost to society of occupational ill-health and injury was borne by employers, although they were by and large responsible for the workplace conditions that led to the injury or ill-health (Hazards 106). The research found “society” bore most of the cost burden, followed by “individuals.” [See: Don’t base policy on deadly lies]. And when the business lobby rolls out its annual whinge about the costs of health and safety regulation, it omits systematically the far greater financial and other benefits of those laws (Hazards 111). The business lobby’s top bugbear is risk assessments, which it complains are petty bureaucracy and a burden. But if you are too dumb to easily and quickly complete a risk assessment on your own business activities, you are too dumb to run that business. We didn't vote to die at work: Campaign briefings, posters and resources. We didn’t vote to die at work facebook group. TUC safety campaign materials: Fighting the cuts to health and safety. How to lobby your MP on health and safety. The case for health and safety. The number of people harmed by their jobs increased by 100,000 last year, according to official figures, while the number of prosecutions and convictions reached a record low. 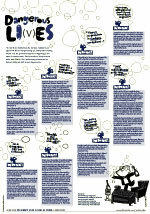 The new statistics were published by the Health and Safety Executive (HSE) on 27 October 2010. Figures for April 2009 to March 2010 reveal 1.3 million current workers reported they were suffering from an illness caused or made worse by their work, up from 1.2 million in 2008/09. HSE said 555,000 of these cases were new illnesses occurring in-year, a 4,000 increase on the number of new illnesses recorded the previous year. A further 800,000 former workers claim they are still suffering from an illness caused or made worse by work. There were 152 workers fatally injured in 2009/10 - down from 179 the previous year. HSE says this is the lowest level on record in Britain, with 0.5 deaths per 100,000 workers. Both prosecutions, down to 1,026 cases, and convictions, at 735 in the year, were at a record low. The use of HSE enforcement notices, which do not result in an employer making an appearance in court or receiving any penalty or bad press for criminal breaches of safety law, increased from 8,079 in 2008/09 to 9,734 in 2009/10. The new high is still lower than the number of notices routinely issued by HSE prior to 2004/05. HSE news release and report, Statistics 2009/10 [pdf]. Two major multinationals have agreed to end sandblasting denim jeans, a practice that has led to deadly lung disease in garment workers. 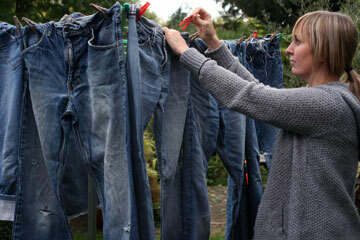 FASHION VICTIM Should workers die a horrific death just so we can wear faded jeans? ITGLWF, the global union federation for the sector, welcomed the September 2010 announcement by Levi Strauss and H&M. “It is the correct decision if we wish to protect the health of workers. For H&M and Levi's – who feature among the world leaders in jeans – going down this path shows an attitude of corporate social responsibility in this field,” said ITGLWF general secretary Patrick Itschert. The union body called two years ago for garment producers and retailers to eliminate worldwide the use of free silica in denim production. Inhaling crystalline silica can cause a deadly lung scarring – silicosis – and lung cancer. The process involves using a jet of compressed air to propel fine sand onto the denim fabric, creating a faded, worn look. However, since 2005 in Turkey alone, more than 50 workers have died from silicosis. In April 2009, the campaign led by the workers, their unions, doctors and civil organisations resulted in the Turkish government implementing a law prohibiting this procedure. But several companies then moved their production to other countries where legislation was less restrictive, including Egypt, China, Bangladesh and Pakistan. Thompsons says research suggests fewer than a third of those eligible to make a workplace injury claim actually do so. Claims are also down for clinical negligence and public liability, with only road traffic accident claims on the up. The law firm says the way to reduce work-related claims, is to make work safer. ‘No compensation culture’, in Slash and burn, Hazards 111, July-September 2010. The Lord Young review of health and safety and the compensation culture, submission from Thompsons Solicitors, July 2010. Resource-compromised statutory enforcement agencies, to the delight of the business lobby, continue to attempt voluntary alternatives to formal inspection and enforcement. And they continue to be dismal failures. An investigation by the US Government Accountability Office (GAO) confirmed what union and other workplace safety advocates have charged for years - the Bush administration's reliance on voluntary policing by employers of their safety and health actions did not improve worker safety and let some dangerous employers escape scrutiny. The GAO report, released in June 2009, concludes that under the Bush administration the Occupational Safety and Health Administration's (OSHA) Voluntary Protection Program (VPP) lacked proper oversight, did not improve worker safety and diverted scarce resources from other enforcement duties. VPP companies are able to avoid routine inspections as long as they demonstrate they have an exemplary safety and health programme, have no ongoing enforcement actions and have an injury and illness rate below the average rates for the industry. GAO found that OSHA did not properly ensure that only worksites that had exemplary safety programmes were eligible for relief from routine inspections. According to the GAO report, 12 per cent of the worksites participating in the programme had an injury or illness rate higher than rates for their industry, and one participating worksite had an injury and illness rate four times higher than their industry average. In addition, OSHA continued to allow some businesses to participate in the voluntary programme even though they were cited for serious safety violations. Back in the UK, a succession of voluntary approaches have flopped. A government review published in June 2010 found most company directors are not taking health and safety seriously at boardroom level, so statutory directors’ duties on safety are the only workable approach (Hazards 111). The Health and Safety Executive (HSE) board was instructed in 2008 to oversee an independent evaluation of voluntary measures taken to strengthen director leadership of health and safety. The evaluation concluded that although awareness of the Institute of Directors (IoD)/HSE voluntary guidance had by November 2009 increased since a similar survey completed in September 2008, it was still only a minority (36 per cent) that had any idea of the existence of the October 2007 guide. Fewer than one in five (19 per cent) had read even a part of document, and less than half of these (48 per cent) took any action as a result. While most directors (65 per cent) felt additional guidance would increase “the amount of effort and attention they personally gave to ensuring health and safety,” about half also pointed to greater penalties for directors (51 per cent) and new legislation (48 per cent) as likely to focus their minds. “The majority of directors believed that each of the measures would increase the amount of effort and attention that they devote to health and safety,” the report notes. Over a third of directors of large organisations thought new legislation “would make a significant difference,” as did one in five small organisations. And now you can add to the list of expensive failures the CHaSPI Corporate Health and Safety Performance Index and a scheme to certify asbestos surveyors. Each use of the Health and Safety Executive-sponsored Corporate Health and Safety Performance Index (CHaSPI) cost several thousand pounds, the watchdog has admitted. Consultancy Greenstreet Berman, which received £50,000 to review the tool for HSE, has received a further £500,000 developing, running and managing CHaSPI over seven years. At the end of October 2010, the CHaSPI website lists 723 registered users, out of which just 151 had “signed off” the index. In October 2010, another initiative failed entirely. The British Occupational Hygiene Society [BOHS] said “with deep regret” it was closing the Asbestos Building Inspectors Certification Scheme (ABICS), a body supported by the Health and Safety Executive (HSE) and intended to ensure asbestos surveyors were certified to have reached the necessary competence standard. It added without a legal duty for asbestos surveyors to be certified, the scheme did not work. It is believed only a minority of ABICS applicants demonstrated the required level of competence. There are now fears it will be easier still for incompetent asbestos surveyors to place workers and the public at risk of exposure, with surveyors selected on price rather than any independent assessment of competence. OSHA’s voluntary protection programmes: Improved oversight and controls would better ensure program quality, GAO report, May 2009 (published online June 2009) [pdf]. The report of the Steering Group overseeing an independent evaluation of measures taken to strengthen director leadership of health and safety, HSE, June 2010 [pdf]. Review of CHaSPI, HSE Research Report, RR813, 2010 [pdf]. CHaSPI. BOHS announces the closure of ABICS, BOHS news release, 6 October 2010. Wherever you go, business lobby groups are trotting out cookie-cutter reports claiming businesses are folding, jobs are being lost, and the economy is being devastated. And the cause? The burden of regulation, with health and safety rules always targeted as a top irritant. The perpetual belly-aching about workplace regulations is packaged the same both sides of the Atlantic, and contains the same dire claims about the impact of employment and safety regulations on business and the economy. It’s a clarion call that gets heard by frequently uncritical government agencies. In September 2010, the US Small Business Administration (SBA) issued ‘The impact of regulatory costs on small firms’, which claimed the cost of federal regulations reached $1.75 trillion in 2008. The SBA-commissioned report puts the annual cost of environmental regulations at $281 billion. In doing so, it adopts the upper limit of far-and-away the highest estimate in any research considered in the review, which is almost 20 per cent higher than the average figure and 60 per cent higher than the lowest estimate. SBA puts the annual bill for occupational health and safety laws at $64.8 billion. The authors, Lafayette College economists Nicole V Crain and W Mark Crain, also say “it is noteworthy” their earlier (2005) study found occupational health and safety regulations “were by far the largest element within the workplace regulations category,” making up 53 per cent of the regulatory compliance costs in this category. In the UK, the British Chambers of Commerce (BCC) produces its own same-problem-same-solutions annual ‘Business burdens’ report. The 2010 edition, published in May, puts the puts the total cumulative cost to business of regulations since 1998 at £88.34bn. Health and safety “burdens” identified in the 2010 report cover regulations providing workers with protection from hazards including explosives, chemicals, work at height, biocidal products, vibration and noise. BCC estimates these safety regulations lead to a combined recurring annual cost to business of £374 million. The cumulative cost since 1998 tots up to £2.963 billion. There’s just a couple of flies in their deregulatory ointment. The arguments are bogus and the statistics behind them are rigged. In the US, SBA admits: “This research, while mindful of this fact, does not consider the benefits of federal regulations, but looks at the overall costs imposed by them.” And in the UK, BCC relegates to the technical notes an admission that the costs to business identified “are net of the benefits that accrue to business.” Compared to the multi-billion annual cost of occupational injuries and diseases, many deadly, the protective health and safety laws BCC calls a ‘burden’ are really no burden at all. Both sides of the Atlantic, the business lobby discounts entirely the cost paid by the victims of slack health and safety standards. And this human price out-strips the business cost several times over. Analyses from the US, the UK, Australia and elsewhere, cited in Hazards’ 2009 ‘Who pays?’ report, establish how only a small part of the cost is borne by business – the one party with something to gain from cost- and corner-cutting at the expense of safety. And while the costs are inflated, the casualties figures are routinely depressed. A 2005 literature review, published in the Journal of Occupational and Environmental Medicine, found in the US both this human and cash cost “is significant but underestimated.” It concluded this was a consequence of the data on the incidence and cost of occupational illness and injury being marred by gaps and systematic methodological flaws in research on the burden of workplace harm. It is a criticism levelled at workplace morbidity and mortality figures in the UK (Hazards 92) and elsewhere. Still, the rigged and lop-sided business costings get repeated as fact and form a core part of the deregulatory arguments that influence governmental policy. For example, the US Chamber of Commerce cites the SBA study as evidence in its ongoing campaign to have regulations, including safety and environment rules, eased and to block planned initiatives. The Chamber’s ‘This way to jobs’ public relations and lobbying push argues for fewer laws and more voluntary initiatives – in its words, ‘compliance assistance’ - on health and safety. The attack forms an explicit part of the business lobby group’s well-resourced anti-union, anti-regulation ‘Workforce Freedom Initiative’. And both sides of the Atlantic the business lobby is complaining about a regulatory burden to business competitiveness that does not in fact exist. Out of the 26 OECD countries, the lowest levels of legal employment protection are found in the USA, Canada and Britain. If the objective is to make worker safer and reduce the related human and economic costs, then regulation and enforcement should be the preferred option. Commenting on the US Chamber’s campaign, Tom O’Connor, executive director of the National Council for Occupational Safety and Health, a coalition of union backed and grassroots safety groups, said it was rehashing an approach that had failed the economy, the environment and workers’ safety for decades. It’s not just that the business argument concentrates solely on the costs rather than the benefits, both business and regulators are inclined to over-estimate the costs and the consequences. In ‘The going out of business myth’, US group OMB Watch cites a succession of dire warnings about the cost implications of the introduction of workplace safety regulations covering asbestos, cotton dust, vinyl chloride and other highly hazardous substances. Industry estimated the cost of rules requiring benzene emissions to be controlled would be hundreds of thousands of dollars per plant. The availability of safer substitutes meant the actual cost was zero. Asbestos, cotton dust and formaldehyde rules came in at less than half the predicted costs. Vinyl chloride rules cost a quarter the pre-regulation estimate. David Michaels, author of the award-winning 2008 book ‘Doubt is their product: How industry’s assault on science threatens your health’ which dissected industry inflated cost and deflated risk estimates, and who is now the head of the US government’s Occupational Safety and Health Administration (OSHA), commented: “In field after field, year after year, conclusions that might support regulation are always disputed. Animal data are deemed not relevant, human data not representative, and exposure data not reliable. Whatever the story — workplace chemicals that cause cancer, diesel exhaust, global warming, sugar and obesity, secondhand smoke, plastics chemicals that may disrupt endocrine function — scientists in the ‘product defence industry’ will manufacture uncertainty about it” (Hazards 103). But business over-estimates costs and ignores benefits with a purpose. It doesn’t want regulations and it doesn’t want enforcement. In the deadly scheme of things, lying so they can leave their workforce in the firing line is the least of their money-motivated crimes. Somewhere down the line, people die when regulatory health and safety protection is removed. That’s the ultimate capital crime. The impact of regulatory costs on small firms, US Small Business Administration (SBA), September 2010 [pdf]. BCC news release and The Burdens barometer 2010 [pdf]. Who pays?, Hazards, Number 106, April-June 2009. The costs to employers in Britain of workplace injuries and work-related ill health in 2005/06, HSE Discussion Paper Series, No. 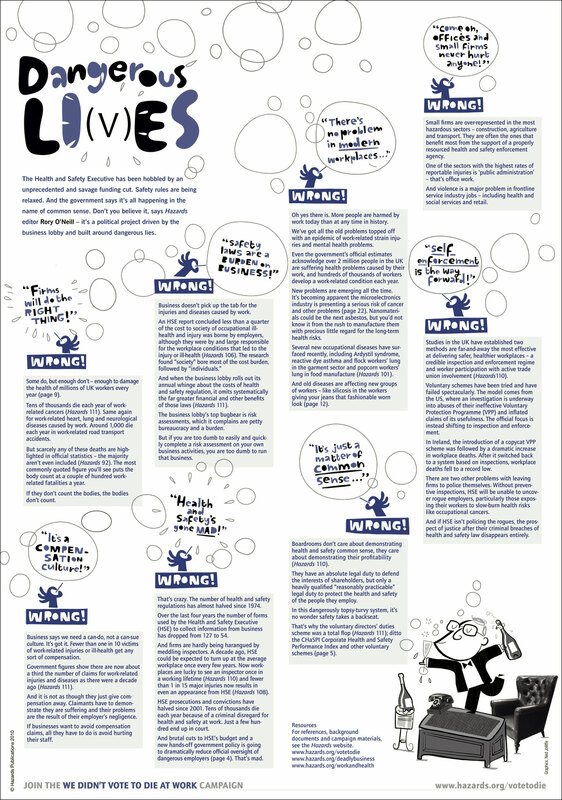 002, September 2008 [pdf]. Economic Analysis Unit (EAU) appraisal values, HSE, July 2008 [pdf]. Directors’ responsibilities for health and safety: the findings of two peer reviews of published research, HSE research report RR451, HSE, 2005 [pdf]. Not too costly, after all: An examination of the inflated cost-estimates of health, safety and environmental protections, Public Citizen, 2004 [pdf]. The going-out-of-business myth, OMB Watch, July 2005 [pdf]. Costs of work-related harms underestimated but soaring, OMB Watch, USA, 2005. Paul A Schulte. Characterizing the Burden of Occupational Injury and Disease, Journal of Occupational and Environmental Medicine, volume 47, number 6, pages 607-622, 2005 [abstract]. Paul J Leigh, Steven Markowitz, Marianne Fahs, Philip Landrigan. Costs of Occupational Injuries and Illnesses. University of Michigan Press, 2000. The Cost of work-related injury and illness for Australian employers, workers and the community: 2005-06, Australian Safety and Compensation Council, March 2009. Enforcement action by the Health and Safety Executive (HSE) has plummeted on almost all major indicators, the watchdog has conceded – and it is failing nearly entirely to address workplace health breaches. A paper to HSE’s 30 June 2010 board meeting notes that prosecutions on health issues are exceedingly rare – an HSE guesstimate indicates they are outnumbered 7-to-1 by safety prosecutions - despite work-related ill-health causing five times as much lost time as that resulting from injuries. HSE estimates work-related diseases also outnumber officially reported workplace injuries by five to one. It means negligent employers causing often fatal long-term occupational diseases at least 35 times less likely to end up in dock as those injuring workers. Review of enforcement by FOD, paper to the HSE board, 30 June 2010 [pdf].